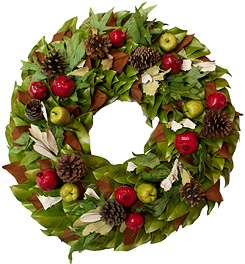 Show off your holiday spirit with a decorative wreath from Katzberry. 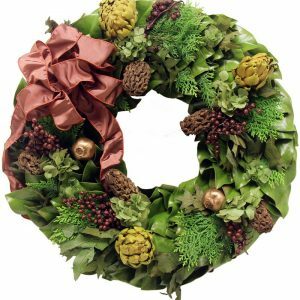 Choose between a variety of beautiful wreaths, like our Apple Orchards Wreath, Autumn Bouquet Wreath, Christmas Traditional Wreath, and more. Hang these holiday must-haves outside your front door to delight guests as they arrive at your abode. In addition to wreaths, we also carry other home accessories, such as mirrors, vases, throw blankets, and pillows. As a leading provider of distinctive home decor online, you can trust Katzberry to provide you with quality products that will last for years to come. Shop our online furniture store today! 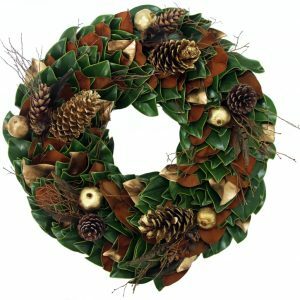 Dried magnolia leaves accented with green oak leaves, copper canal berries, artichokes, magnolia pods and hydrangeas create a beautiful magnolia wreath for the fall season or year round. Includes a beautiful rust colored bow. Fresh Bunches of Magnolia, Boxwood, firs and cedars intermingle in this fresh garland for the holidays. Add a matching wreath and create a stunning entry for your home this season. This holiday collection is natural and warm with loads of elegance for this holiday season. 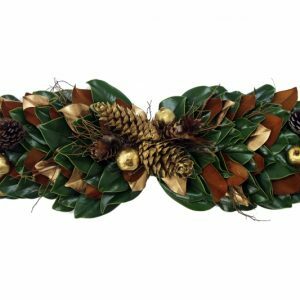 Fresh copper & green magnolia leaves are accented with gold pinecones, feathers, shimmering twigs, gold balls and golden woodland creatures. Gold lacquered magnolia leaves are nestled in the mix of this beautiful magnolia mantelpiece. Gorgeous lavender-colored faux hydrangeas and limes mingle with birch spring branches and green hydrangeas to create an absolutely stunning wreath. 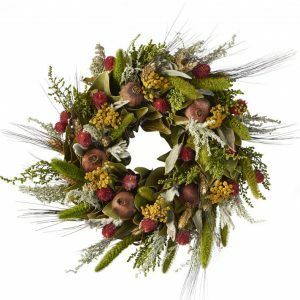 Brighten up your front door this spring with a bounty of faux lemons, dried green artichokes, berries, yarrow and flowers. 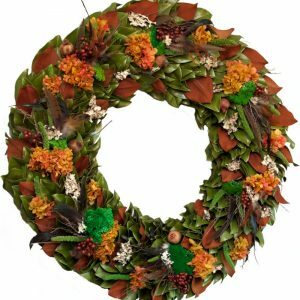 Accented against a base of dried magnolia leaves that were cut off the family farm, dried and then lightly coated, this spring wreath will brighten the cloudiest of days. Wake up winter with this colorful spring magnolia wreath loaded with bright shades of green and variations of pink. Hydrangeas, limes, roses, peonies and yarrow mingle against a base of magnolia leaves that are cut off the family farm and dried in the barn. 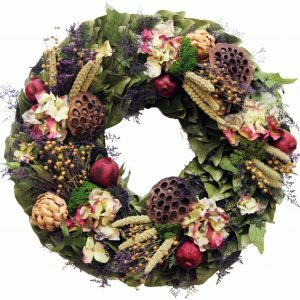 This dried spring magnolia wreath will surely brighten up your home! Feels like spring with an abundance of wildflowers woven throughout this wreath! Pink peonies, wildflowers, yellow and green hydrangeas, purple caspia, plum cockscomb and green canella berries combine against the perfect setting of dried magnolia leaves cut fresh from the family farm and then dried. Goodbye winter… hello spring! Beautiful pink roses, peonies, and hydrangeas contrast with spring green ferns and yarrow to create a bright and cheerful wreath for your front door or home. 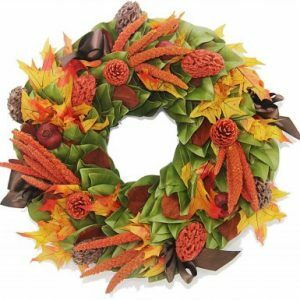 This vibrant spring wreath is handmade in the USA from magnolia leaves cut off the family farm, dried in the barn, and lightly coated with a finish to help preserve its leaves. Vibrant green and raspberry-colored hydrangeas, spring oak leaves, pink pepperberries, lichens and wisps of caspia combine to create this beautiful spring magnolia wreath. Magnolia branches cut from the family farm, hand-made into a wreath, and dried to perfection create the perfect backdrop for these pink accents. One of our very favorites!! Vibrant pink and cream roses abound throughout this magnolia spring wreath along with hydrangeas, lichens, grasses and a little birds nest. Gorgeous rust hydrangeas, pomegranates and pheasant feathers combine to create this stunning dried magnolia wreath. Golden hydrangeas, quince, yarrow and dried grasses create a warm sunset hue to this dried magnolia wreath getting you ready for warmer weather.